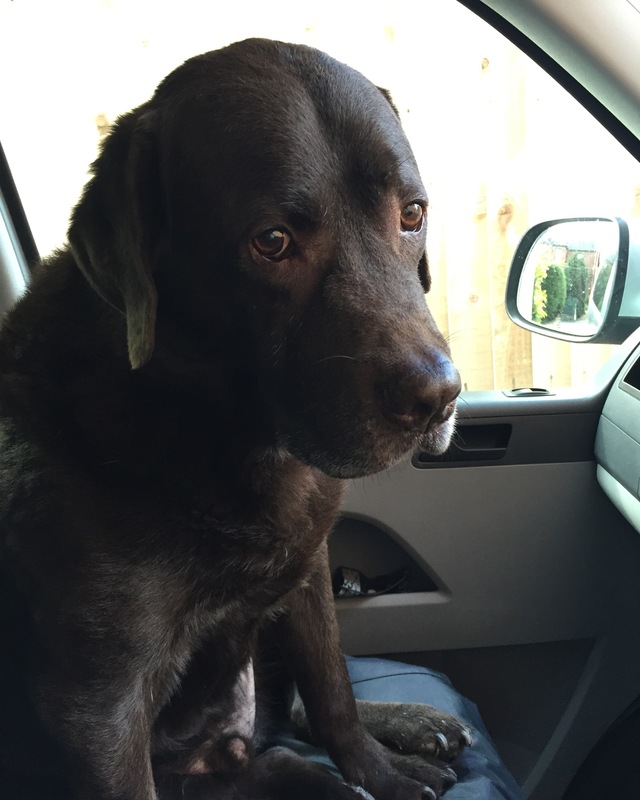 After our elderly lab Monty died in January, being heartbroken was an understatement. We had had him since a puppy, and he really was my best friend. It was so difficult and painful and we shed so many tears over him, as his health failed and we tried desperately to save him, making the decision to let him go and also after he had gone. The thought of ever getting another dog was just not on our radar, because as devastated as myself and my husband were, we at least understood that it was the best thing for him to be pain free at long last. The children didn’t and my son especially struggled to come to terms with and process his grief. We all really really missed having a dog in our lives though. A very active and outdoorsy family, we had got used to the walks diminishing as arthritis gradually stole our boy from us, but we were still making the effort to get him out as much as we could, even driving him to the beach for his last sniff of sea air. Life just wasn’t the same without him in it. The horrid quiet as I opened the door, no wet nose to nudge me, no sound of his nails clicking on the tiles alerting me of his presence. The thought of just choosing a new puppy from a breeder just didn’t sit right with me for some reason, I just couldn’t bring myself to inquire although we spent hours pouring over breed characteristics and picking out the types of dogs we might have one day. One evening, I took my cat to the vets, and they often have the staff member’s dogs behind the reception desk while they work and there was an adorable dog there that evening, so friendly, with large ears and a long tail, he totally won my heart in minutes. 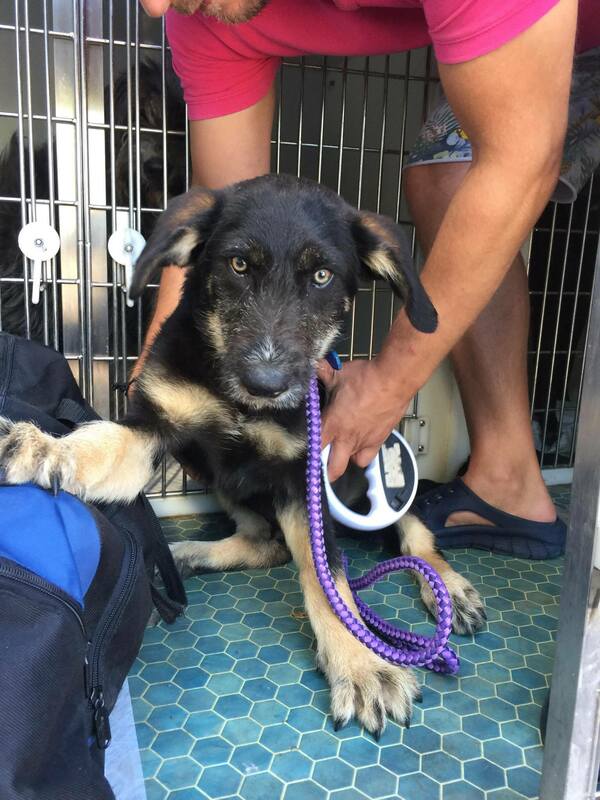 As I chatted to the receptionists , they told me that he was a Romanian street dog that had been re-homed with one of the vet nurses through a charity called Amicii Dog Rescue. Well, I got home and tentatively broached the idea with my husband. He was worried about getting a rescue with the children around, not knowing the breed etc etc. We looked at the website and there was page after page of soulful eyed pooches, either named by their sponsor or given nicknames relating to their circumstance, ‘box puppy 1’ etc. This is our little baby arriving into the country. Doesn’t he look scared? We looked at each other and we both knew that this was what we were supposed to do, and agreed to try and adopt one after our summer holiday. I said that I would ring the vets the next day and get some more info. They passed my number to Marilyn, one of the UK coordinators and she got the ball rolling incredibly quickly by telling us about a puppy that she had seen just the week before who was due into the country the following weekend that she believed would be perfect for us. Gulp! We were wracked with indecision, we had spotted one on the website that we had instantly fallen in love with but he was so scared and timid in the video she sent, our family would just be too much for him wouldn’t it? Plus he was older, but by choosing the other, would we be confining him to a miserable life in the shelter? It was so hard! Marilyn never outwardly said ‘no’ but continued to steer us gently towards the other puppy, who was funny, confident and playful in the videos she sent us. He just didn’t look like any of the dogs we had had before. Wiry and almost wolf like with intense eyes, plus he was pretty big for a 4 month old puppy, what was he going to grow into? Ideally we wanted a dog that could fit in the campervan with us, it didn’t look likely with this doggy. 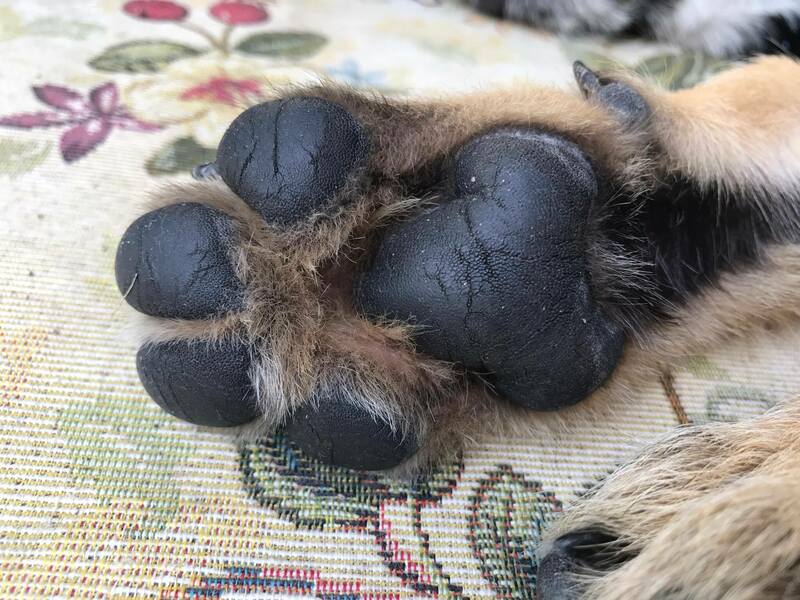 A message from Marilyn telling is he had ‘the biggest paws she’s ever seen’ made us think that maybe he’ll be far too big for camper trips!! Finally we made a decision, we’d watched the video time and again and he just looked like the doggy version of our son, diving into his water bowl with gusto. We would take him! The following weekend, giving us just 10 days to prepare ourselves and our house for the arrival of a puppy. Marilyn came round to meet us and to give our home and garden a thorough check over to make sure it was safe and he couldn’t escape as ‘Rommie’ dogs often try and bolt in their first days and weeks in a new home. We were at Cornbury festival that weekend (write up coming soon!) and we got a message from Marilyn that she had collected ‘Duke’ for us, the name he had been given. She sent us several photos and videos, the first of him looking petrified in the van as he arrived and then a few of him making himself at home in her kitchen! The nerves were building but also the excitement. It was the most epically glorious sunny weekend though, and we were determined to enjoy the festival despite all our urges to run to get him straight away! The following day was Sunday and we went home to shower before going to Marilyn’s house to pick up our boy. Would we like him, would the kids, would he like us, what would he be like?! The questions were spinning and we all felt worried. One thing we did know was that he was in good health, all the dogs from Amicii come with very comprehensively filled out passports and all their vaccs, worming etc info filled in. He was also neutered. On arrival, we were warmly greeted by Marilyn, she had put the foster lady on standby as she had noticed Duke barking at the noise of children in the garden and wanted to be certain that he was going to be ok with us. He was a timid boy at first, hiding under a bench but equally desperate for affection and he slowly warmed up to us. We spent an hour and a half at Marilyn’s house, carefully watching his reactions and making sure he would be alright with the kids. He soon got over his initial fears and his bold and playful nature meant that he wanted to be involved in the children’s games before too long. When she, and we, were happy, we took our new puppy home. Look at that face, he had no family and no-one to love him. Find out how we’re getting on with him here and a more comprehensive update here. Hooray, what a brilliant thing to do. Good for you. 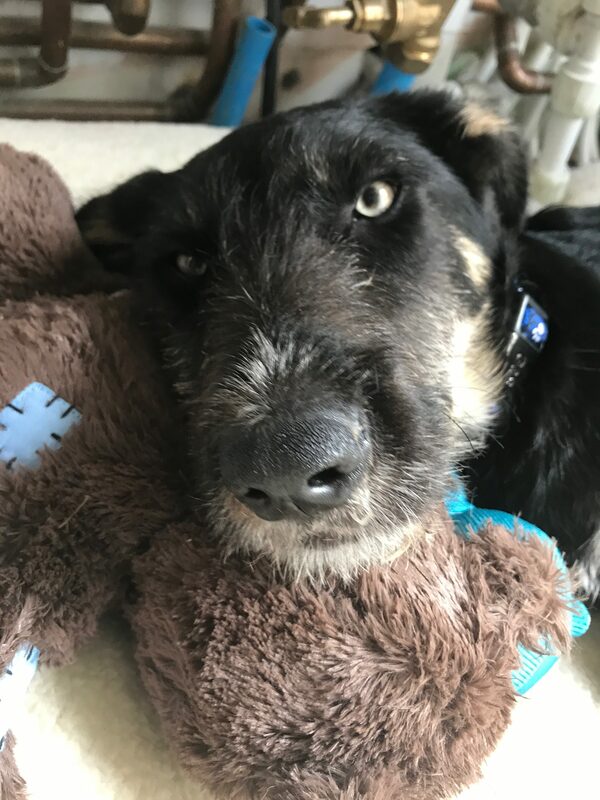 We also adopted a 4 month old rescue dog and it was the best thing we ever did, despite going through some tough times afterwards, which were made much more difficult by the presence of a rather chewy puppy! He just looks like an old soul! Wow, I’ve never even heard of dogs rescued like this. We’ve always had a rescue dog. They’re so fantastic. Barney is precious!!! What a GREAT thing to do!!! He will be a treasured member of your family and you are teaching a valuable lesson to your children! As a dog lover (I frequently pick up strays & have two of my own) I commend you for taking the leap of faith and going with a rescue! I understand the hesitation because of the kids-I have felt that too, but there are simply too many out there that need homes & too many breeders that (basically) keep them from getting the homes they deserve! My bad! I stepped away to help a kid & forgot where I was! DUH!!! Glad it all worked out for you. Any dog every a special bred puppy comes with issues. We have always had rescue dogs and have been lucky with them. Onto rescue dog No3 this month, last one only got 17 months with us before being riddles with cancer at 7 yrs old, from diagnosis to sleep in 3 weeks. But we know she had a brilliant 17 months and was loved and cared for due to our pet insurance.